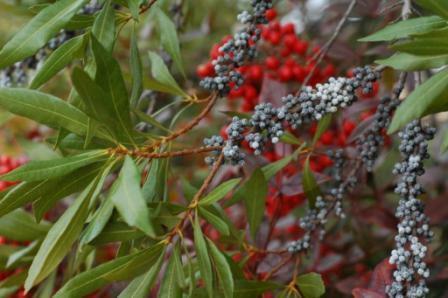 TYPE: Evergreen, small to medium ornamental tree. NATURAL HABITAT AND PREFERRED SITE: Swamps and moist woodlands, on shores of streams and lakes and in wet grasslands of the Pineywoods and East Texas through Central Texas in general. 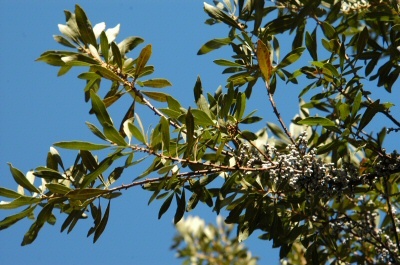 Wax myrtle will adapt in a garden or landscape situation to sandy or acid soils if given reasonable moisture and just a moderate amount of fertilizer. 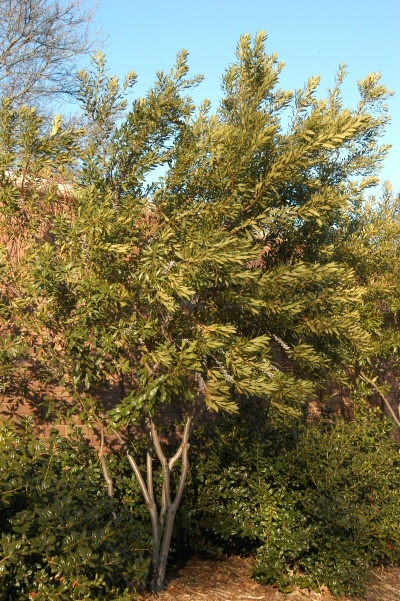 IDENTIFICATION INFORMATION: Small multi-stemmed tree with delicate evergreen foliage that is a light green in color. 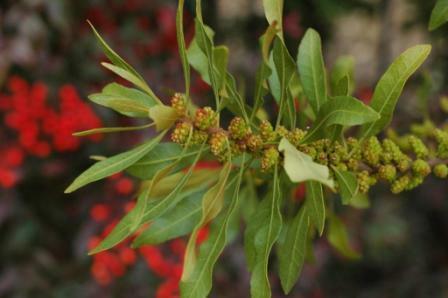 FLOWERS AND FRUIT: Golden yellow and green female and male flowers that are short, scaly, erect on different plants (dioecious) from March through April. They are small and inconspicuous and spike-like catkins. 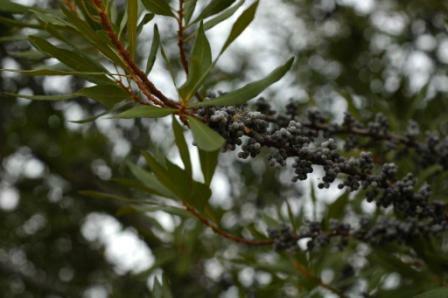 Fruits of the female plants are small blue berries or droops that are clustered along the stems. BARK: Smooth textured, light to medium gray. Texture gets heavier with age. 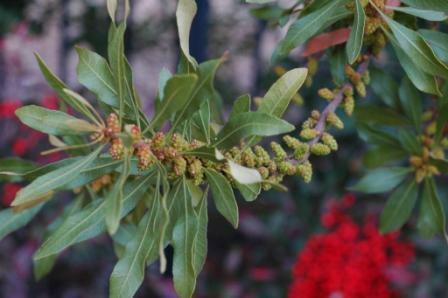 FOLIAGE: Small, alternate, single resinous, medium green leaves. Aromatic foliage has fine yellow glandular dots especially beneath, providing fragrance when the leaves are crushed. PROBLEMS: Brittle wood, suckers and freeze damage in the northern part of the state. PROPAGATION: Seeding can be done by sowing outdoors in the fall or stratifying for 60 to 90 days at 34 to 41 degrees. Natural germination occurs in the spring following the seed fall. Cuttings can be rooted from softwood or semi-hardwood cuttings and the plant can also be successfully transplanted either balled or burlapped or bare-rooted in the winter. INSIGHT: This genus has the ability to fix atmospheric nitrogen through root nodules just as do legumes. Birds and other wildlife like the berries. 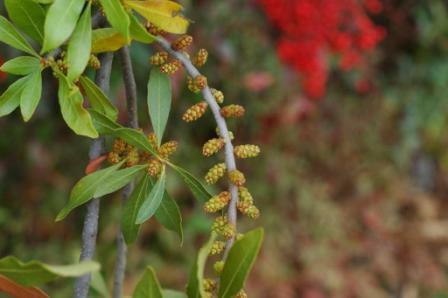 Myrica pusilla is dwarf wax myrtle which does well in Texas also. ANSWER: The salty water and recent hot weather most likely are the problems. Adding compost tea, fish and seaweed emulsions, Garrett Juice or other carbon-based products to the irrigation water will buffer and help eliminate the salt problem. These mixtures also can be sprayed on the plants and soil.